During a kitchen remodeling project, it is beneficial to consider changes to your cabinets. With such regular use, this part of the room experiences extensive wear and tear, which may make your kitchen lose its charm and value. If you seek to improve your kitchen, custom kitchen cabinets may be right for you. Decide exactly what you want to enhance the beauty of your cooking and eating area. Also consider what style may transform your home into a more desirable market item. 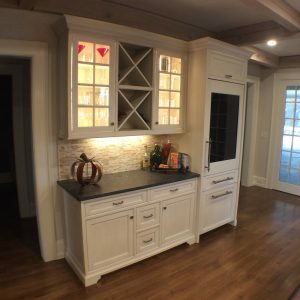 Once you learn that custom kitchen cabinets fit your renovation goals, explore the following topics to make the process enjoyable and stress free. Remember that hiring a professional is the best way to make your dreams a reality. When it comes to customization, sketches of the designs and items that you want are extremely helpful. You do not have to be an artist, though. Roughly outline what you desire, or even dictate your ideas to an expert interior decorator. Whether you provide the sketch to the professional or you let the professional draw the design, you are now able to work with your team to determine a realistic budget for your plans. Once you outline the things you want, it is time to decide what colors and styles best fit into your kitchen remodeling project. Consider the entire décor of the space to determine how you can coordinate every part of your kitchen. Choose the designs and styles that create an atmosphere that you love. Lastly, express your personality in your custom kitchen cabinets. Experiment with different materials. Try a different layout. Consider what each cabinet will be used for and create a unique space that accommodates those needs. The most important part of the kitchen remodeling project is to hire an expert. A licensed contractor can help you plan and coordinate your custom kitchen cabinets to express your personality beautifully.